It’s no secret that Man’s Best Friend can often be a natural lawn’s worst enemy. But do you know why? One answer is nitrogen, a basic chemical found in high concentrations in dog waste. It’s the stuff that turns natural grass yellow after Fido has visited a spot often enough. The problem is worse with female dogs and male dogs that squat to relieve themselves. That’s because they tend to release all of their urine at one time – and hence deliver a major nitrogen burst. Male dogs that mark tend to only mark their territory. On the other hand, a dog that marks may return to the same spot repeatedly. Either way the result is the same: a brown spot often with a green ring around the outside. Regardless of the reason, when you have a natural grass yard, urine spotting is a constant, ongoing problem. Your choices to truly remedy the problem often come down to setting up a dog run or using a fence or gate to keep your wonderful pet off the grass. Another option is a top-quality synthetic grass. A high-quality artificial lawn will not be affected by the nitrogen content in canine waste. NewGrass™ in particular is highly resistant. Its Fescue, Rye and Bermuda varieties each carry a seven-year warranty and are broadloom-tufted from quality polyethylene or a combination of polyethylene and nylon. 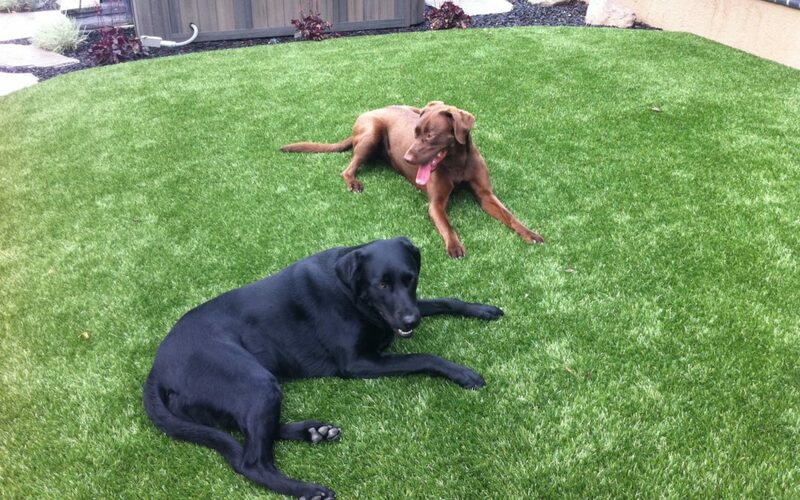 In fact, three highly regarded pet hotels in Arizona have chosen NewGrass™ for their outdoor runs. Raintree Pet Resort and Applewood Pet Resort, upscale pet hotels in Scottsdale, and Boulder Falls Pet Resort in Phoenix, all feature NewGrass™ for their canine guests to romp on. According to statistics, the next most common source of damage by dogs is digging by younger animals. Digging is usually a challenge with younger, more active dogs. They’re more playful. They like to roughhouse … and they may love to dig. Dogs often dig because they hear rodents or other critters underground, or because they want to build themselves a bed. The most common reason, however, is that your dog is bored. Your options: be consistent in discouraging this bad habit, and provide your dog plenty of toys and exercise. That’s about it, except for one other obvious remedy: synthetic grass. Dogs can’t rip into it like they can natural turf. And rodents and critters are far less likely to burrow under a properly installed artificial yard grass. For example, the heat-treated nylon and polyethylene used in NewGrass™, along with the backing layers of urethane and polypropylene, simply are not appealing to most turf-loving critters. And your dog will be hard pressed to dig through a professionally installed NewGrass™ lawn.